Cloudy skies this evening will become partly cloudy after midnight. Low near 40F. Winds N at 15 to 25 mph..
Cloudy skies this evening will become partly cloudy after midnight. Low near 40F. Winds N at 15 to 25 mph. 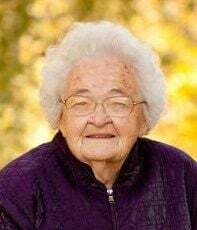 AINSWORTH, Iowa — Anita P. Davis, age 98, of Ainsworth, Iowa, passed away peacefully on Tuesday, April 2, 2019, at the United Presbyterian Home in Washington. Anita was born December 9, 1920, on the family farm in Muscatine, Iowa, the daughter of Chris and Hilda (Dammann) Stange. She graduated from Muscatine High School in 1938. Anita attended Wartburg College in Waverly, Iowa, and the Iowa State Teachers College in Cedar Falls, Iowa. She received her Bachelor of Science Degree from the University of Iowa. Anita was united in marriage to Burdette Davis on February 21, 1952. Anita resided in the Ainsworth community all of her married life. She was a teacher at Clearview Country School in Muscatine and Garfield Elementary School in Muscatine. Anita taught grade school at Cotter and later taught special education at Cotter, retiring in 1979. She was a member of the Zion Lutheran Church in Muscatine and a faithful attendee at Cotter Presbyterian Church in Cotter. Anita was a member of Delta Kappa Gamma, the County Line Neighborhood Club, Hobby Club and Cotter Guild. She enjoyed growing and tending to her flowers and loved to attend the Louisa County Fair. Anita was a member of the Artists in Action and enjoyed painting wall hangings and cards that she shared with family and friends, knitting and clay sculptures. She wrote two children's books and read to school groups for many years. Anita was very active in remodeling and maintaining the Ainsworth Opera House and helping with the annual Nativities Around the World display. She is survived by her son, Robert Davis, and wife, Lori of Columbus Junction, Iowa; son, Dr. Randall Davis, and wife, Cindy of Colleyville, Texas; grandson, Jeremy Davis of Cedar Falls, IA; and granddaughter, Ashley Davis of Silvis, Illinois. She was preceded in death by her parents; husband, Burdette, in 1999; and siblings, June Pries, Don Stange and Ray Stange.